And all in less than a month. Those of you that know me will know i've wanted to go too the Nordkapp for the last few years, this time last year i was even planning a trip to head there in the then new year... Unfortunately, as is often the way, life got in the way and it didn't happen. However this year, there is no excuses, i've decided that its something that i need too get out of my system, and as me and Tim have failed to go anywhere exciting for over a year now, it needs too be done! The info at the beginning of this is pretty much all the plan i have at the moment, although i have spent most of this evening putting a very rough route together on Google Maps, which has led too me getting rather excited and also a wee scared in some ways! Originally the plan was to head up through Holland, Germany, Denmark, into Sweden and keep heading north until i hit Norway, head north some more until i literally run out of road, with any luck i'd be at the Nordkapp! 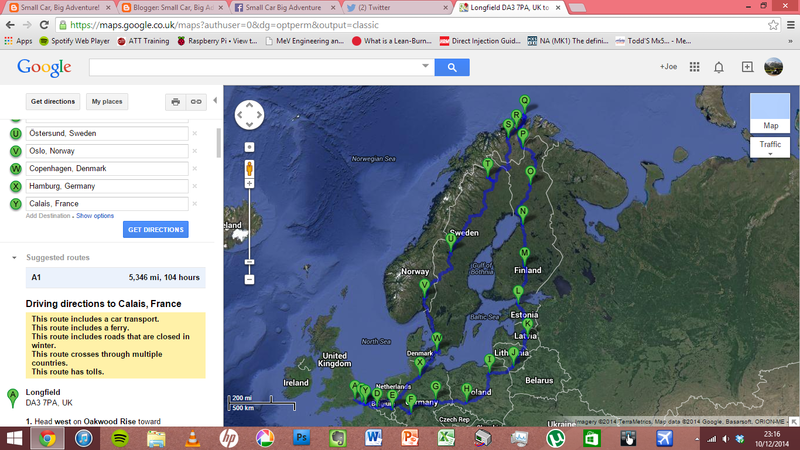 Then head back down, probably following the west coast of Norway a bit more on the way back... Then i had an idea, i'm not a fan of doubling back on myself on a trip until i hit Dover, so the 'Baltic Circle' idea was born... Tadaaaa! Mini wise everything is fairly okay, there's quite a bit to do but then there always is, he's running well though, new engine has done around 2'000 miles now and hasn't gone bang so that's a definite good sign! More info on Tim prep as it happens and in another post.... This one was supposed too be a short one! Weather is going too be an issue i think, i'm not too sure on just how bad it's going too be inside the Arctic Circle around February. Everyone i speak too tells me something different, so i've just came up with the 'Bugger it!' attitude and decided i'll find out for myself...! The cold i'm not too worried about, its more how quickly i'll get bored of digging Tim out of several feet of snow every morning! More updates as they happen folks, and thanks for reading! Hi Joe - commented on your Contacts page but had a failure message so hope you get this. What's the state of play with the trip up north and are you still after a co driver - hint hint.